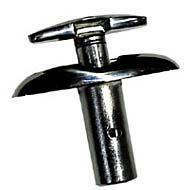 Marine Hardware SS Retractable Fender Cleat Assembly. Cleat portion is 2.5". Uses #10 Fasteners.